These savage young rock'n'roll instrumentals live for 'kicks'! And beware the 'square' who stands in their way! 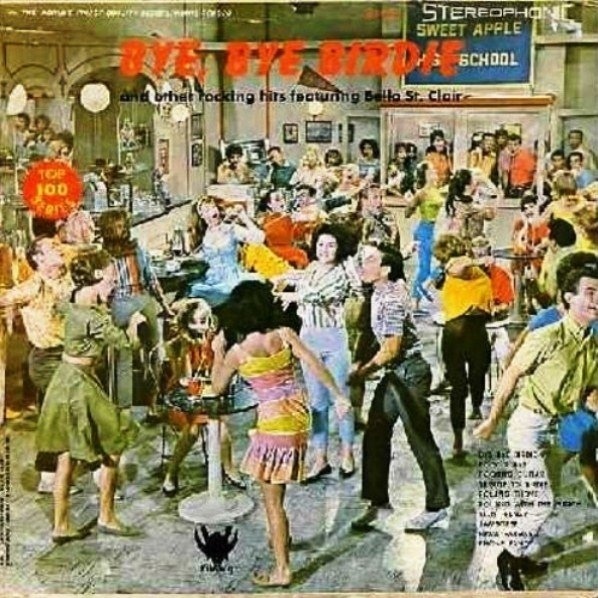 In the 1950s and 1960s, countless records were cranked out by the "budget labels," whose releases were essentially the music industry equivalent of cheapie exploitation films. Like those groovy movies, screened at drive-ins and grindhouses away from respectable cinemas, budget records were usually not found in record stores, but in the racks of places like drugstores. They were impulse buys, sold for a dollar, at a time when proper albums went for $3-4. And like z-movie producers, budget labels used all manner of deceptive, eye-grabbing visuals to lure suckers, er, I mean customers into buying their often inferior products. Case in point: an album called "Bye Bye Birdie" with an album cover (pictured right) presumably depicting a scene from the musical film of the same name. This album features a grand total of ONE (1) song from the film (and a remake at that). 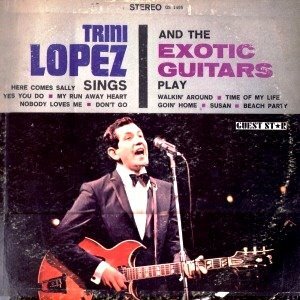 Also featured here are albums by popular folk/pop star Trini Lopez, and jazz-man Buddy Tate, both featured only on side one. So who was performing on the rest of these albums? Who knows? It is safe to say that there never were any actual bands with names like the Exotic Guitars or the Rock and Rollers Orchestra. Budget labels would acquire tapes, sometimes thru rather dubious means, and release them under a variety of phony artist names and song titles. It may seem hard to believe now, but in the '50s/early '60s such now well-regarded styles as blues, r'n'b, and rock'n'roll were, for the most part, not considered mainstream. So these tapes could be had for cheap. It's unfortunate that we'll probably never know who performed this music, since it's quite good. The Exotic Guitars sound like session cats doing their impression of surf rock, and the Rhythm Rockers might be sessioneers, too. But I would imagine that the Rock and Rollers Orchestra was a black rhythm-and-blues nightclub band - they blow like crazy, dad. Music scientifically designed to rock a party to da break-a-dawn. The band probably never made a penny from these recordings. Of course, there's lots of uninteresting filler out there, too. And we're lucky with today's selections so far as sound quality is concerned, since budget labels like Crown were notorious for using the worst quality vinyl, and these sides sound pretty good. Both the Bella St Clair and the R'n'R Orch records start off fairly low key before getting increasingly crazed, so perhaps there was some actual thinking going into the sequencing at least. Those albums cover, tho...oy. That Buddy Tate one's a beauty, eh? This so-called music does not please God. And staying up all night is not good for your health. And dancing is a sin, so stop it! Mike Huckabee for President! Wow, sounds like a gas Reimer, looking forward to it. Heed what Kenny says, children of god - savage jungle rhythms is the devil's music! Lets all go listen to some Amy Grant, now, shall we? No, Amy Grant performs that devil voodoo backward masked rock music CCM. Just to clarify things a bit: Much of that "drugstore" music was recorded specifically for cheap-o releases, so the use of anonymous session players is way likely; in some other cases, the music was performed by non-US groups, with a different "band" name slapped on later. That niche market became so successful that several major labels developed their own budget LP divisions. "Notable artists to have begun their careers recording for budget albums include Lou Reed, Jerry Cole, Sun Ra, Al Kooper and Tina Charles. Perhaps the most notable artists to emerge from a career as a "cover artist" for budget albums include Dolly Parton, who early in her career as a teen-aged vocalist, recorded several covers of Kitty Wells hits for budget album release, and Elton John, who recorded in the late 1960s and early 1970s for the Top of the Pops album series." Thanks, Freddie. Never even bothered to check to see if there was a wiki page for budget labels, thought that was too obscure. "That niche market became so successful that several major labels developed their own budget LP divisions" - that's pretty funny. And I believe Sun Ra's infamous Batman cash-in album is on WFMU's blog somewhere. some very cool stuff here but i'm kinda confused about how to download. i see a few posts are zippy but how do i get this post or e.g. the vol 4 low brow coll? 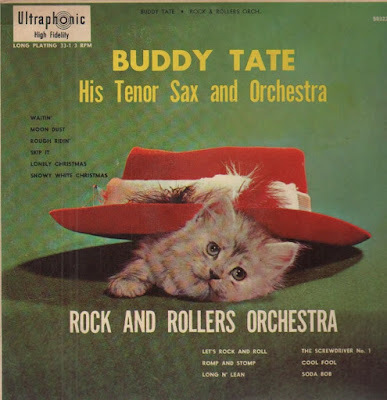 & the buddy starcher reminds me---i have that lp btw---that i also have a cab calloway!! 45 version of "history...". unless i dreamt it. hi JavaMan, click on "KILLER FILLER", then on the arrow top of yr screen, in the center. That's the download arrow. It may take you to another screen that says 'virus scan.' Hit "Download Anyway." unfortunately Zippyshare stopped working for me and had to find an alternative. That's a great list Anastasia. Don't have any of those, but I sure have plenty of their American cousins. Oh, and - Cab Calloway?! *puts on mining helmet* I'm gonna start digging for that one.